Question: What do you get if you take your recording ambition to Texas, hook up with a stellar and proven band, call on a known producer, and centre the album on classic and original tunes? 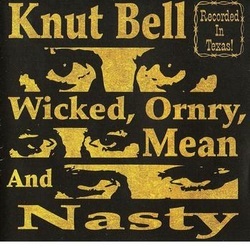 Knut Bell and Wicked, Ornry, Mean and Nasty is your answer. Sitting ever so comfortably in a post Waylon slipstream, this singer and talented songwriter returns with his fifth album. Out now on Marlingspike Music, the 12-track jukebox is a real good listen. Produced by Derailers lead man Brian Hofeldt, the album is a steady mix of keen guitar, steel, and fiddle. With names like Redd Volkaert (guitar), Hayden Vitera (fiddle)) Mike Daily (pedal steel) and Scotty Matthews (drums) on board, the sound is gutsy, real and driven. Add Bell’s barroom growl and it’s Saturday night country. Bell, a former fisherman who turned from tuna to twang, has penned eight tracks here. Cuts like the peppy “Skagit Days, “with its tale of rural hospitality and daily life, is a primer to an album radio needs to play. Other cuts that please include the cheeky “Haybales”, a telling tale of the dangers of roadside curvy distractions, the remembered classic “Lost Highway” and “An American Man” with rightful homage to Johnny Cash, a knockout Hofeldt tune. This album hinges on an authentic thread of honest and image-driven country. The playing is superb. The voice comes honed from an awareness of what’s being sung. And, given the liner sleeve revelations, that of demons and addictions, the title track takes on significant meaning.